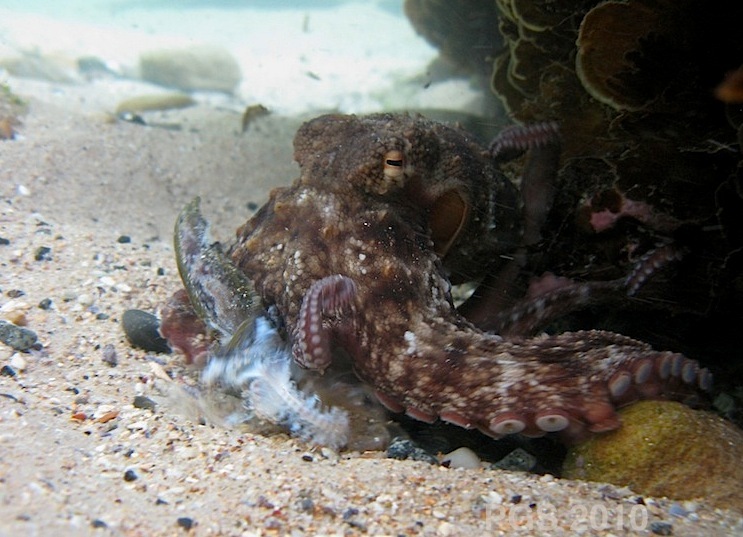 The octopus photos in this post are from a couple of years back, when I came across an octopus devouring the remains of a fish. 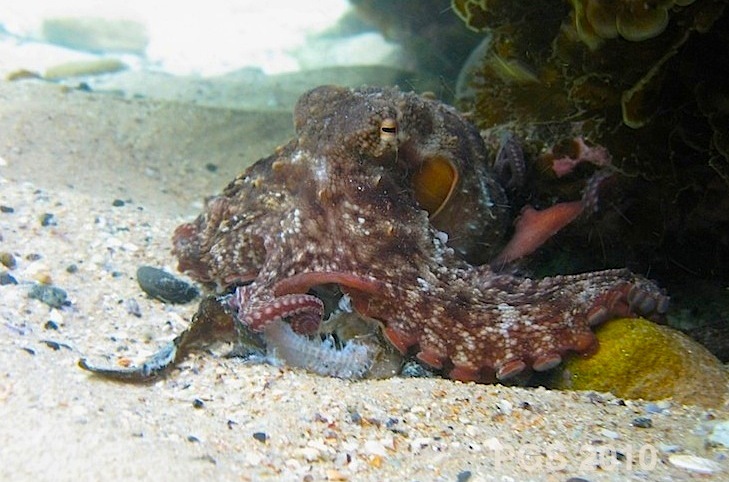 I don’t know if the octopus caught the fish, or was scavenging. Either way, the octopus was very enthusiastic and there was not much left of the fish. This post, though, is written from trains in France and Belgium, zooming through farmland. Some months back I wrote on this site about eating animals, vegetarianism, and humane farming. I don’t have a problem with carnivory per se, but oppose the cruelty of much modern farming. One set of comments came from Christiane Bailey, who doesn’t think that a distinction between standard and “humane” farming makes much difference here. She put up some information in support. One thing that stayed with me was some data on the lifespans of animals farmed for food. 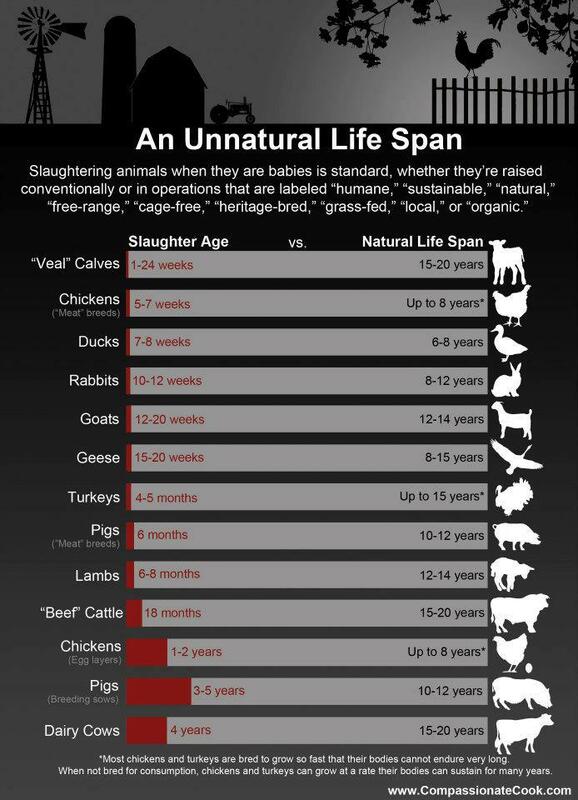 According to the chart, animals bred for food live just small fractions of their natural lifespan – for pigs, 6 months; for ducks, 7-8 weeks. If the position of the previous post was that if we are to farm animals then we should give them a decent life, then there is a constraint to think about here: the good part of that life cannot be too short. Not long after that discussion, I drove through farmland near San Gregorio, in Northern California. The cows hanging out there in the gentle Californian sun looked completely content. I guess they might have been quite young, despite their size, but I found myself thinking that we had not done so badly by those cows, even though their end – like nearly everyone’s end – was not going to be pleasant. And watching the countryside from the train here, a lot of cows are looking very content also. Unless I don’t understand the hidden lives of the San Gregorio and French cows at all, this seems long way from an industrialized drug-drenched American feedlot, and far from the horrors of Australian “live export,” where animals are crammed in suffocating ships to middle-eastern and asian countries for brutal slaughter in accordance with archaic religious rules. Here in France one menu included “suckling pig.” This led to some thought and discussion. On one side, there is the fact that pigs by all accounts are intelligent and rather charming animals. Can’t we stop being so cruel to them? On the other side, those animals would not exist at all without farming. The remaining scraps of wilderness would contain a few boars and sows, leading very different lives, and that would be it for the pigs. I take it that quite a few people who work on animal rights at the moment think this is the right goal (see here and here). We should retire the last generations and have no more. They think that exploitation is just not what we should be doing to animals, and “humane” exploitation is still just exploitation. I see the force of what they are saying, but find myself thinking that “exploitation” is not the right category to use when sorting through this problem. And even if it was possible to eradicate the use of animals for food, leading to the disappearence of pigs and the San Gregorio cows, I am not sure that this is best option, even as an ideal. However, one good principle might be to stop eating mammals (at least) at such a young age that there is not enough of a life there for the life to be worth living – we should not eat them so young they have no chance of a good number of those San Gregorio cow days. Then suckling pigs are definitely off the menu. Along with various other things. The last picture below is unrelated. I mentioned in the previous post the competitive stretching of male Giant Cuttlefish, to display to each other. I linked to one of the better photos I have of the display. “Better” there referred to the animal – the photo itself shows its low light and murky water. The photos on this site are only minimally modified, if at all – some are cleaned up to get rid of floating specks of sand, and some are brightened, sharpened a bit, or have their “white point” adjusted. 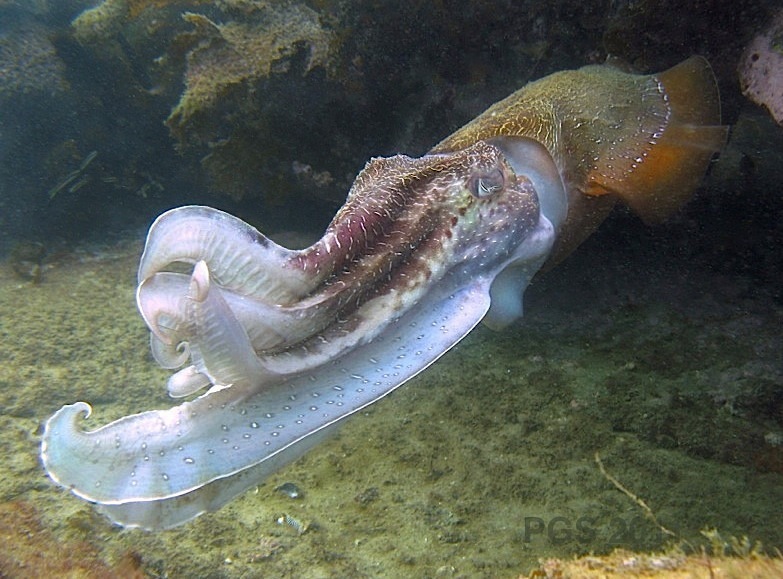 ** This photo, though, I did more work on, for a better image of a cuttlefish grand stretch. * Nicholas Kristof wrote a good column about animal welfare, especially the problem of factory farming, today (7/28/13) in the New York Times. And here is another Times story (7/30/13) about the effects of factory farming on the spread of dangerous drug-resistant bacteria in humans. And here is a very good article I just came across about humane slaughter. ** Except for the GoPro frames – those ones have been re-worked much more.